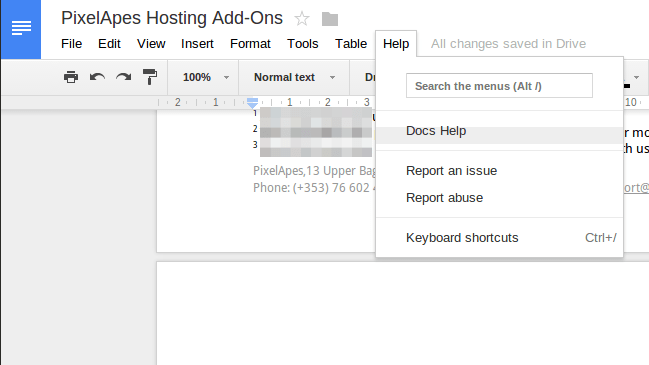 I’ve been finding myself using Google Docs more and more for work. Considering that I work at a distance from my business partner and increasingly work with additional remote partners, a collaborative tool like this makes a huge amount of sense. I’ve even found myself collaboratively editing a spreadsheet via my tablet whilst on a video call after my laptop ran out of juice – definitely very useful! Anyway, as I am a keyboard shortcut junkie, I thought I’d share my favourite keyboard shortcut for the document editor. This may sound like a lot of work, but it’s actually remarkably fast, plus it has the benefit of not requiring you to remember ever single individual shortcut, and it gives you access to a lot of menu items for which there are no keyboard shortcuts. Being able to do any menu command without having to move your hand from the keyboard to the mouse, click a menu item and select it is surprisingly beneficial. Plus the search is ‘fuzzy’ which means you could type “isch” and it will return “Insert Special Character”. Or you can type “11” and it will return “Font size: 11”. Just being able to change font size in this manner is a huge time saver.